I have recently returned from a diving trip in the Similans (Thailand). After the four day liveaboard trip I felt a tingling sensation in my left toe and right thumb. I went straight to the SSS chamberin Phuket where I was assessed by the Doctor. My symptoms were sporadic and were developed in various parts of my body (elbow, hand, knee etc). I had two table 6 treatments followed by two table 5 treatments. I then flew home around 85 hours after my final treatment. I was diving with an instructor throughout the trip and well within the limits of my Suunto Stinger. There was no apparent cause for my case of the bends. I still have a few tingles in my left hand. I was discharged by the doctor with no firm confirmation that I had the bends.......treatment was more precautionary. However, in order to satisfy my insurance company I have to have a fit to dive medical before I return to diving, which I plan to do in July. I'd be very grateful if you could get back to me regarding the type of medical I may need. An interesting story here. No provocative dives, but symptoms that were still resistant to an awful lot of recompression. Two Table 6's, or 62's in the UK Navy definition, is quite a lot for minor tingling in a toe and a thumb. We would normally do 1 only, with more follow up shorter treatments, until all the symptoms have gone, or there is no difference in tingling from one treatment to the next. The so called plateau. But I would say that if you did improve in the pot, and your residual symptoms are way less than what you started with, then this is most likely to be a bend. So you need to put that on your medical form. 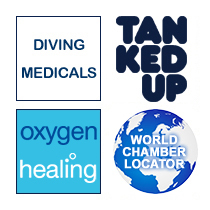 Your insurance company is right; you do need to have a check up before diving again. It's a straight forward "fit to dive after a hit" medical where we look closely at your nervous system. A couple of other issues here. Although you stayed well within limits, and your Stinger made no noises at you on the dive, we are all physiologically different, and dive tables etc are only a guide. It is possible to pop out of that bell curve and be the rare case at either extreme. Also bear in mind other factors that can increase on gassing, or decrease off gassing. Dehydration and diarrohea are examples, and these can occur in a boat in the hot sun in a far flung destination.